I like to do a little Halloween decor coffee tablescape each year. This year I had Jay carve the pumpkins haha. Other years I've put fresh flowers into large pumpkins but I didn't want to spend money on flowers just for them to die within a week. I wanted a setup that could last a little longer so I bought a couple of cacti. Who doesn't love a good cactus? Obviously this setup would be the worst idea if you had little kids since the coffee table is within reach! We know all of the cactus rules so it worked out fine haha. This skull "vase" is actually an old vodka bottle that Jay and I drank from during our first frat formal together. It was one of the last times that I ever drank too (I don't produce an enzyme to digest alcohol through my liver so drinking became increasingly dangerous). 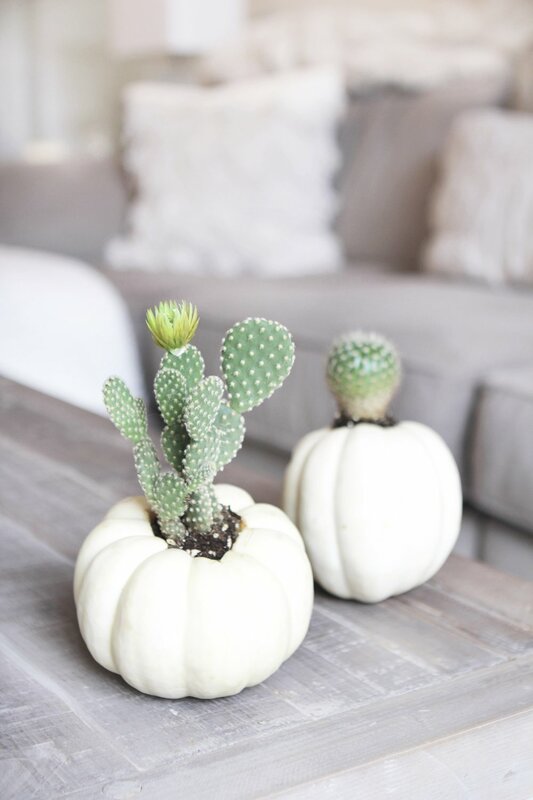 I love that he kept it and I love that we now incorporate it into our decor each fall! I linked a similar one below in case you like the idea! Happy Halloween, friends!